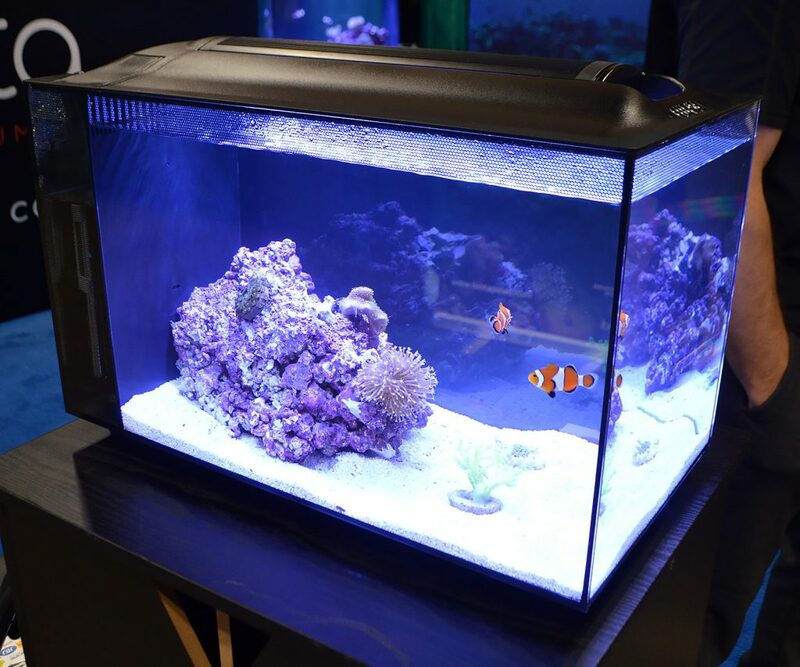 While freshwater aquariums and livestock dominated the Aquatic Experience – Chicago this year, there was no shortage of traveling marine aquaria on display, while a number of new aquarium products were being debuted and previewed at the event. 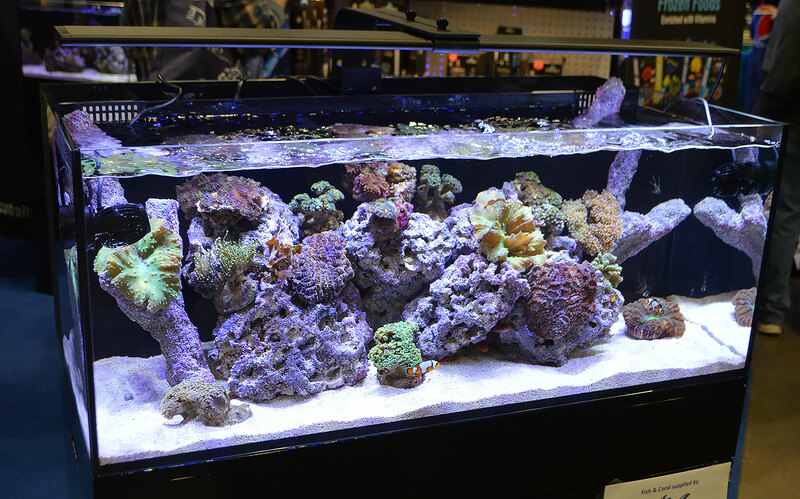 What follows is a pictorial meander through the saltwater aquarium setups and livestock offerings, from November 2016. 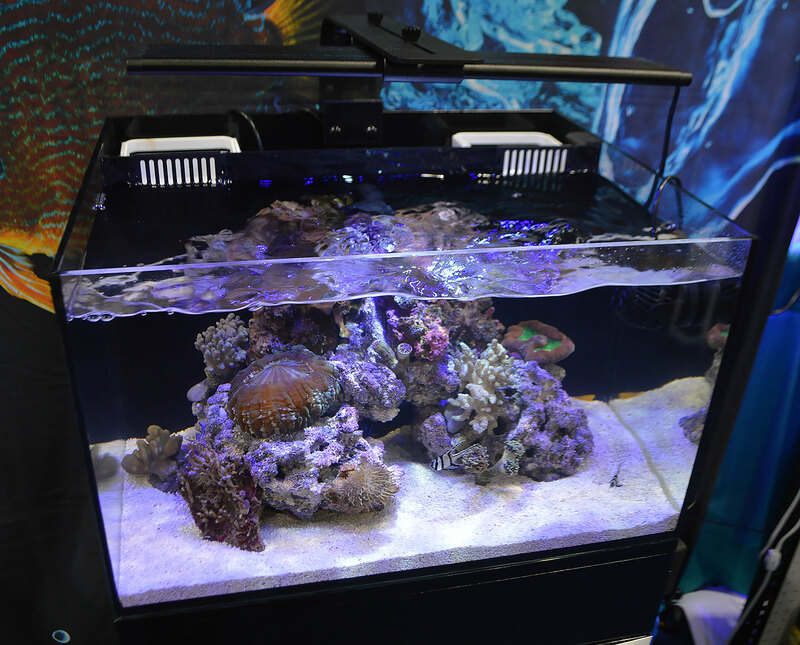 A small reef all dressed up in black at the Red Sea booth. 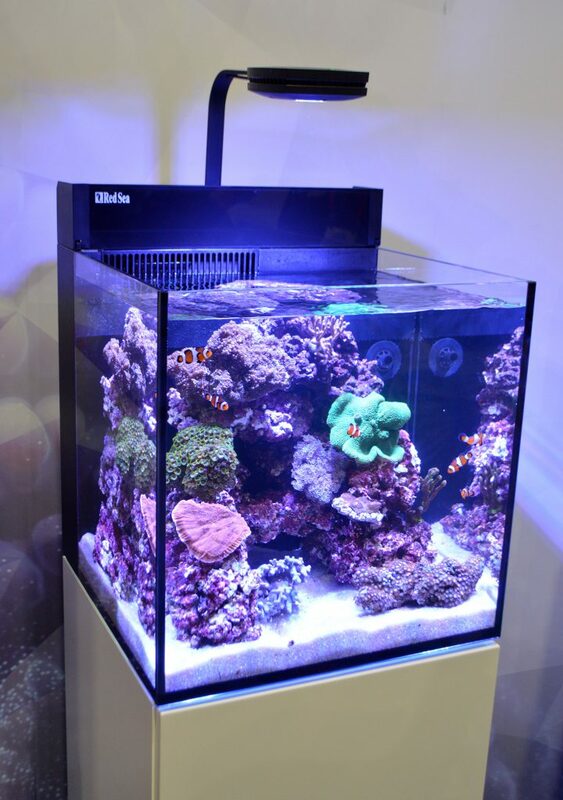 Red Sea’s other small reef, this time on a white stand! 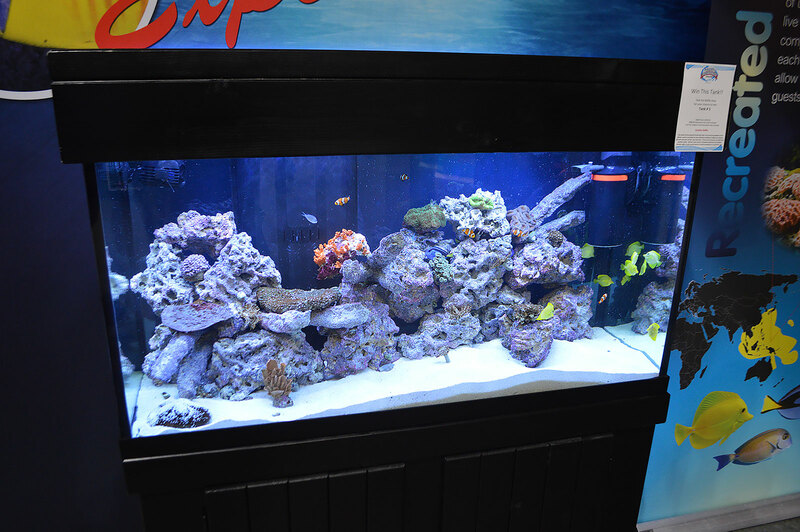 Corals and fish on display by ESHOPPS. 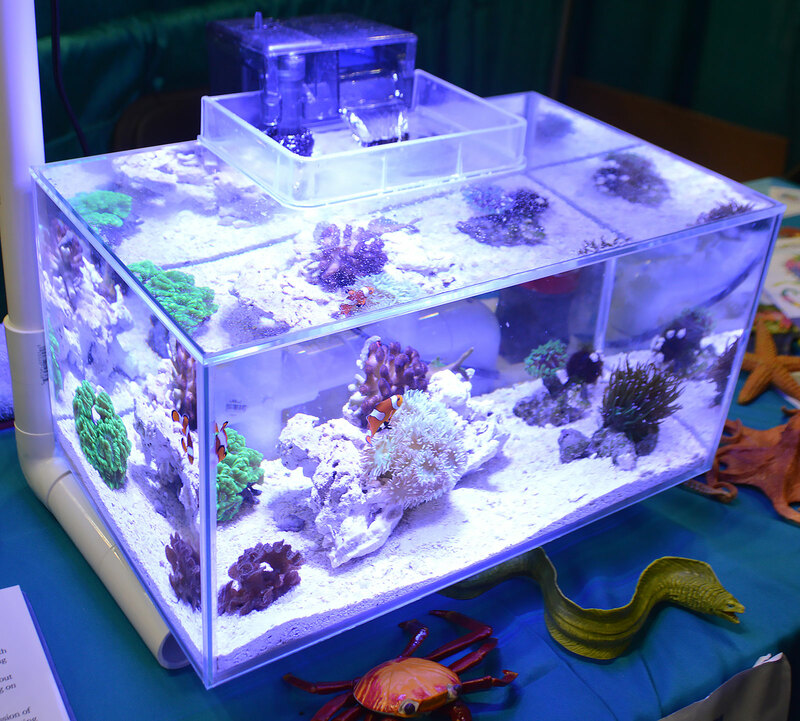 Biota Aquariums had several small tanks on display. 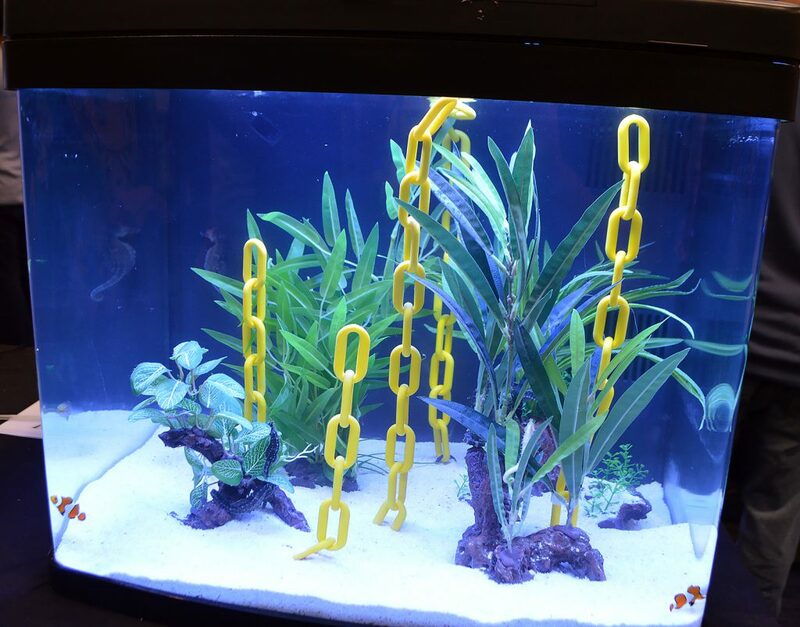 Hidden somewhere in the rockwork was a Biota Aquariums captive-bred Mandarin Dragonet. So cute (if you got to see it)! 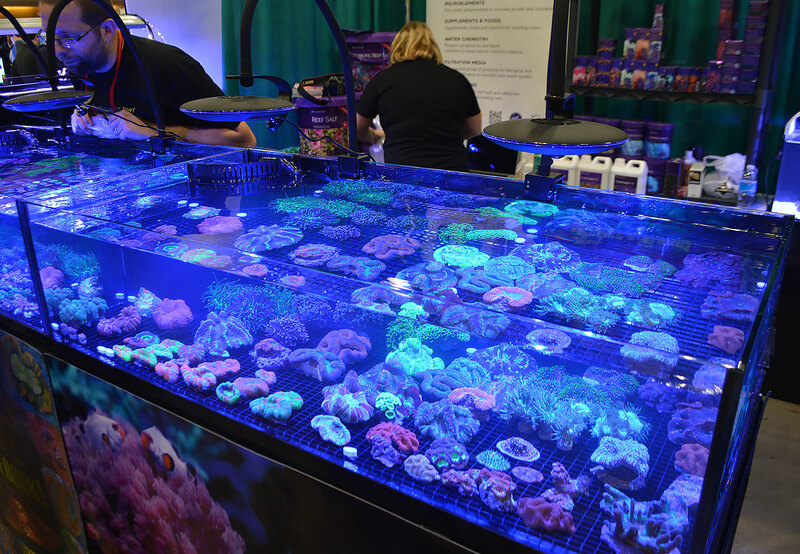 The main marine/reef/saltwater display that attendees saw upon entering the Aquatic Experience – Chicago. 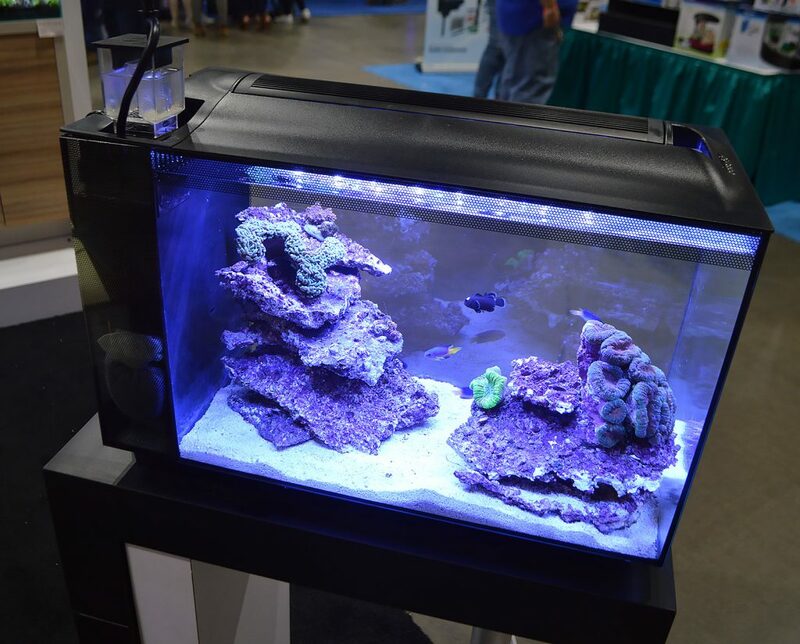 Fluval showed off multiple incarnations of the Evo 13.5 in their booth. This was the first. A second Fluval EVO 13.5 in the Fluval booth. 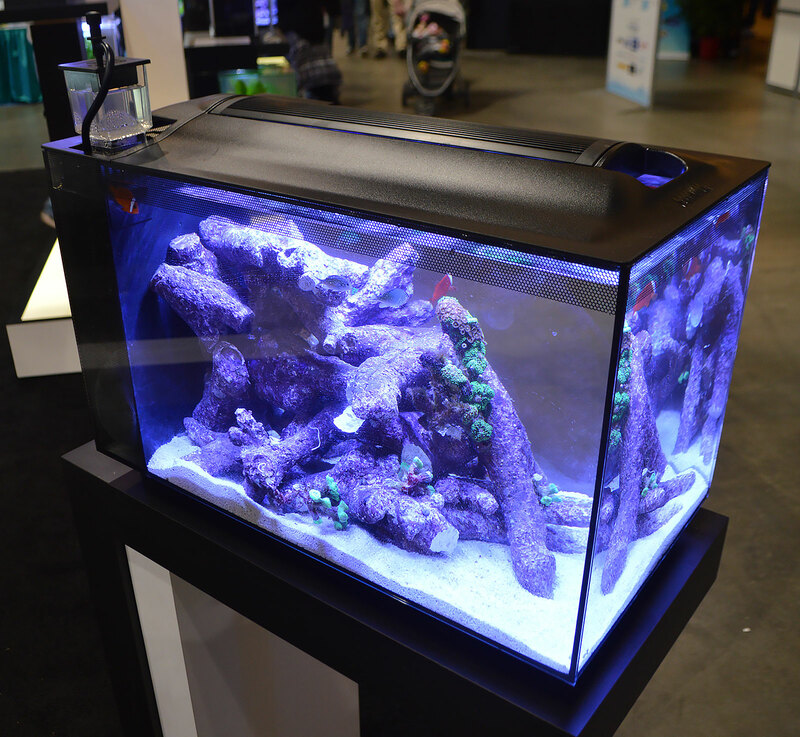 A third Fluval EVO 13.5 in the Fluval booth. 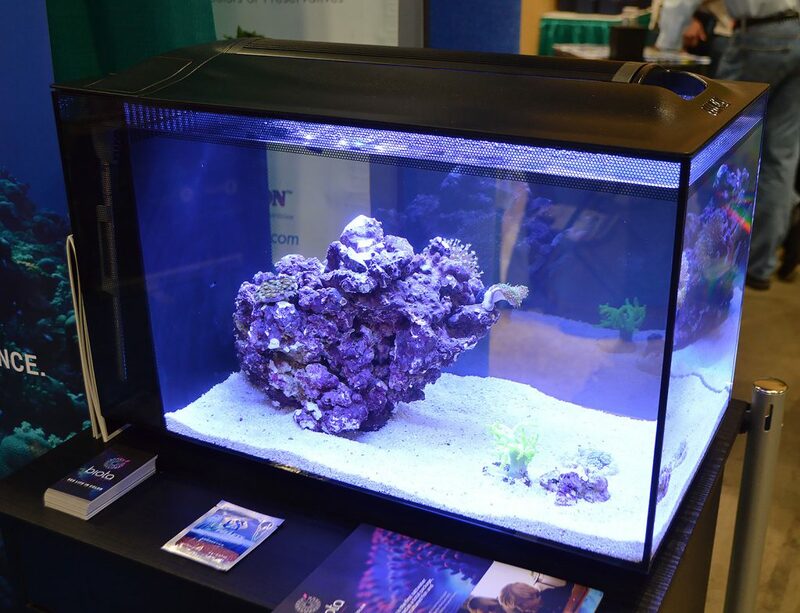 Cobalt debuted their new C-View line of glass all-in-one aquariums at the Aquatic Experience – Chicago. 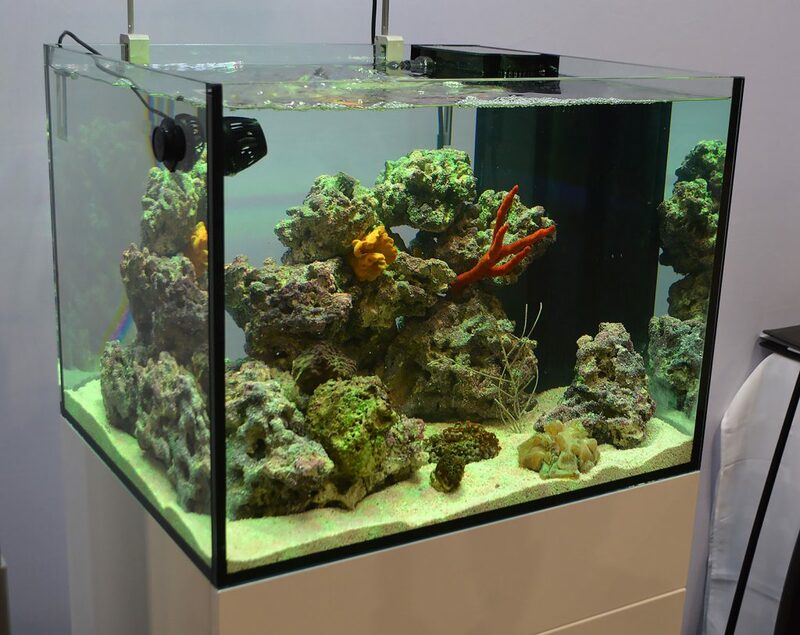 One of the larger models of the new C-View aquariums from Cobalt, which include features such as low iron glass, non-tempered back panels, and piano lacquered stands for longevity. The lighting shown on this example is the Orbit IC from Current. If time permits, we may show you more of these! 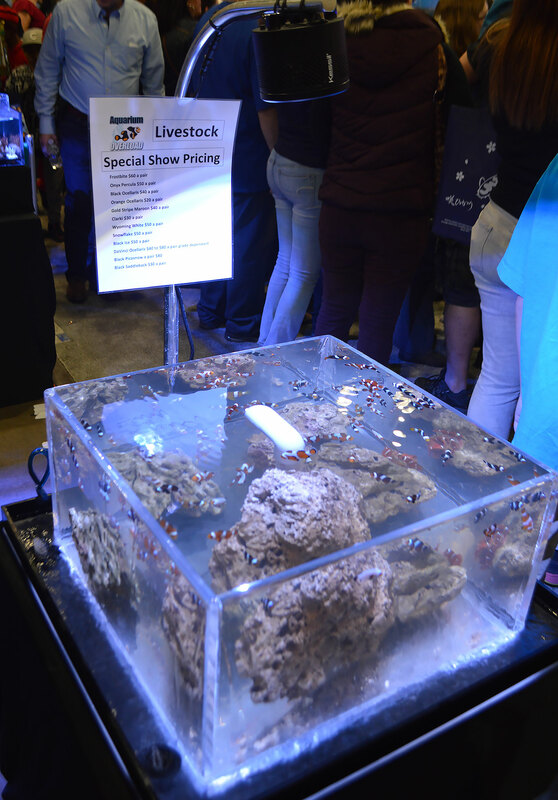 Seahorses were on display at the Beyond The Reef booth. 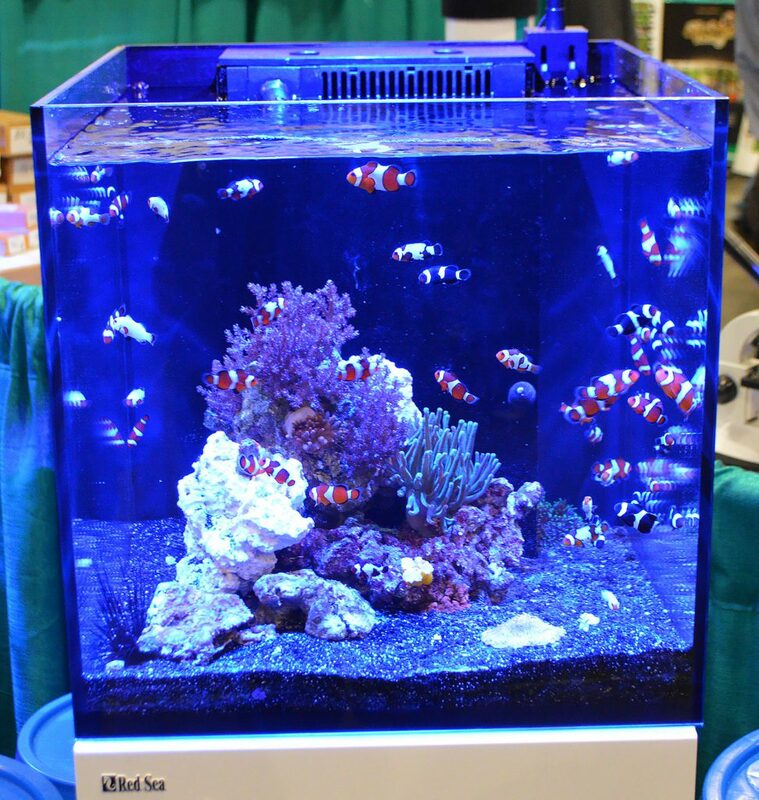 Seven Seas Aquatic Life was showing off many aquacultured clownfish. 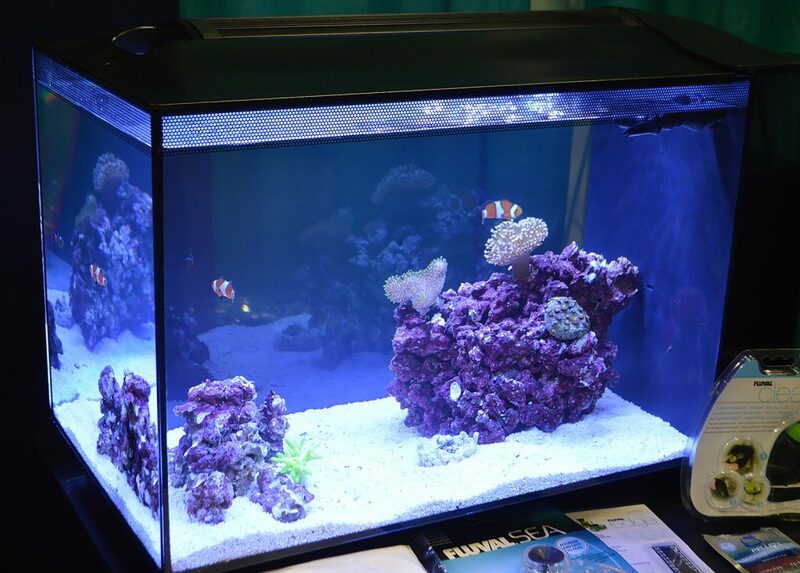 Aquarium Overload, a northern IL-based clownfish producer, was also offering many unique clownfish varieties for sale at the show. 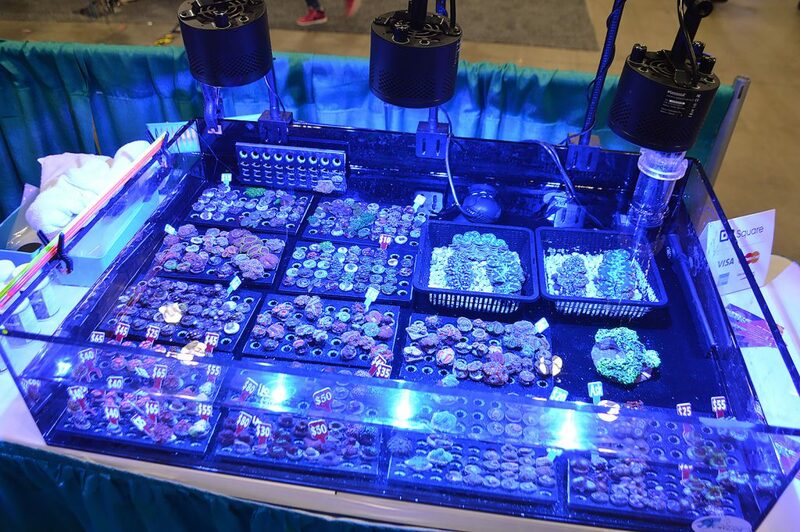 Raising Reefs shared booth space with Aquarium Overload, showing off a wide range of coral frags. 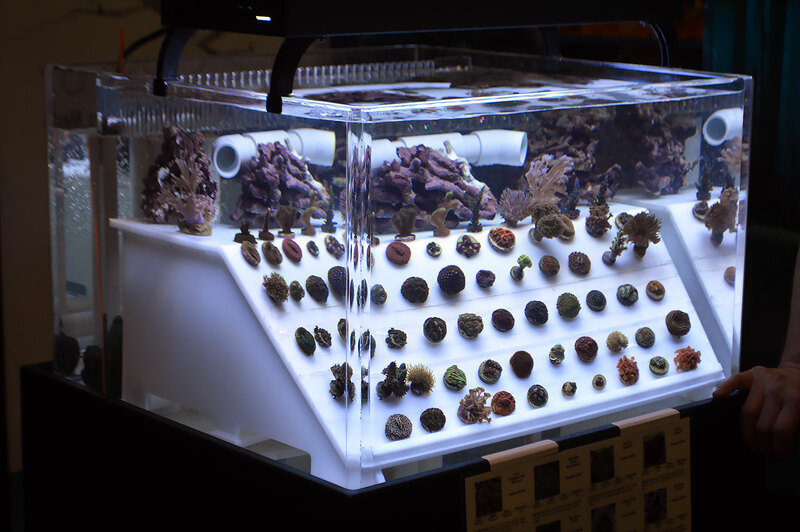 More reef aquarium livestock being offered for sale, these by AcanLord. 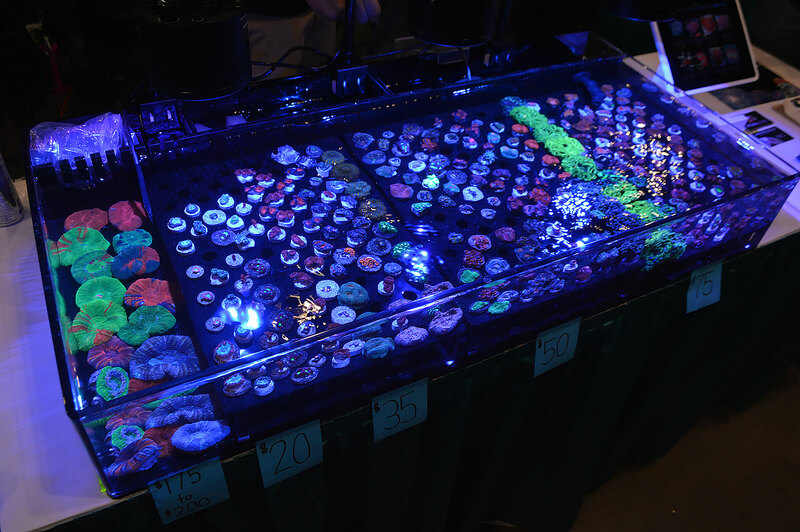 Corals being offered for sale by Reef Geeks Of Chicago. 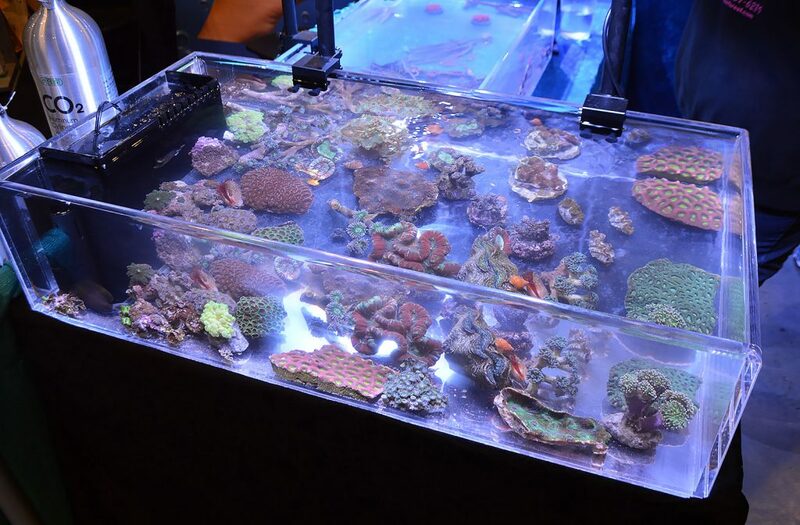 More coral sale offerings, these by Wojtek’s Reef. 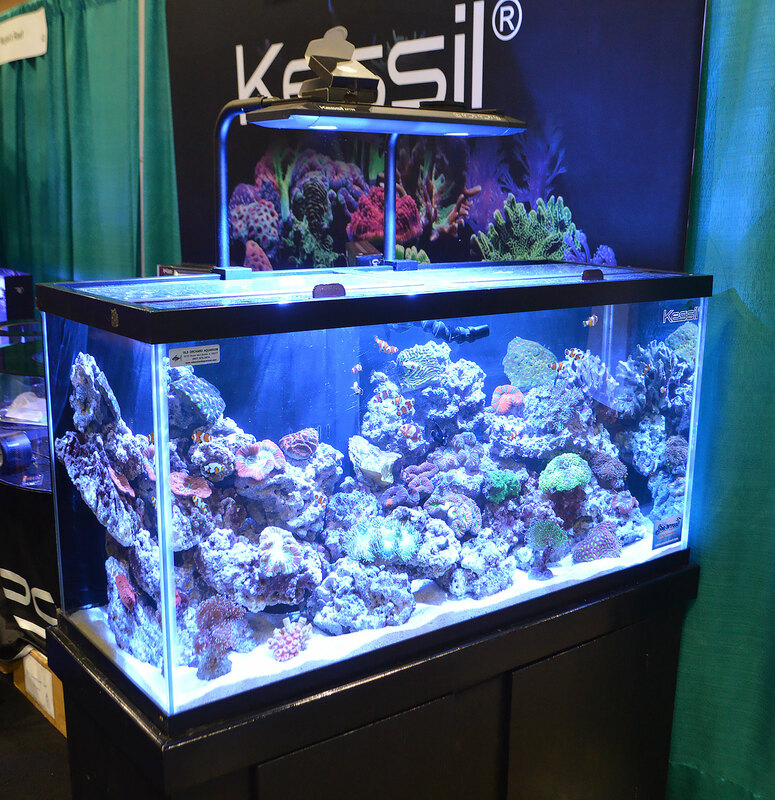 A smaller reef aquarium set up in the Kessil booth. 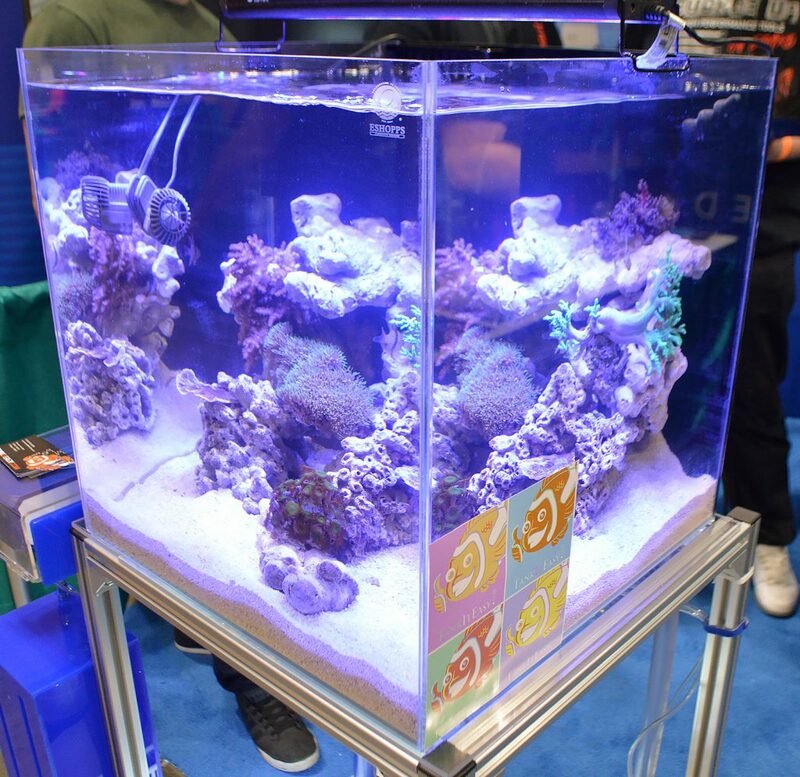 The larger reef aquarium installation in the Kessil booth; the display was installed by Old Orchard Aquariums and prominently featured captive-bred fish from Sea & Reef Aquaculture. 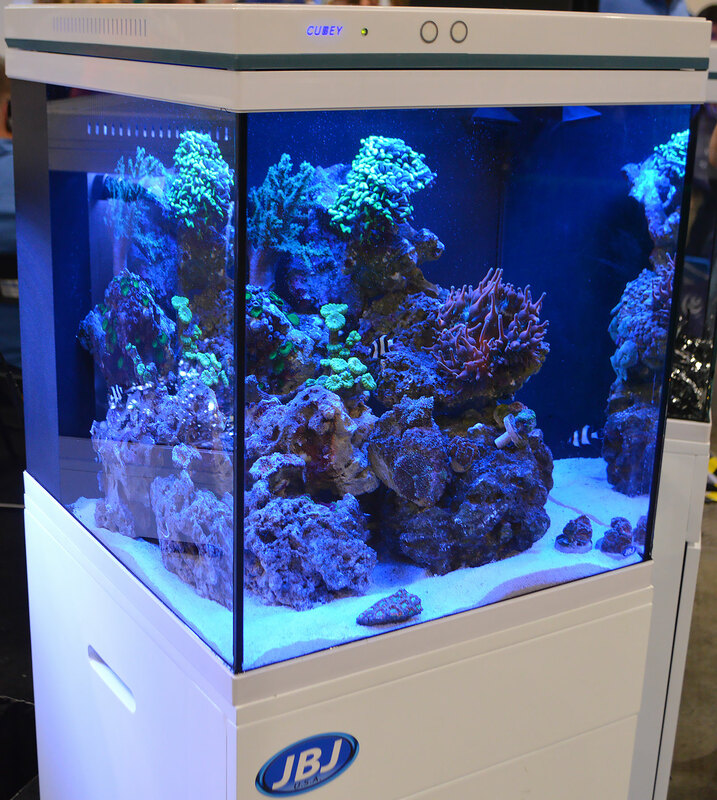 The marine aquarium display in the Hydor booth. More marine aquarium livestock offerings; this was one of the aquariums at Beef’s Reef. 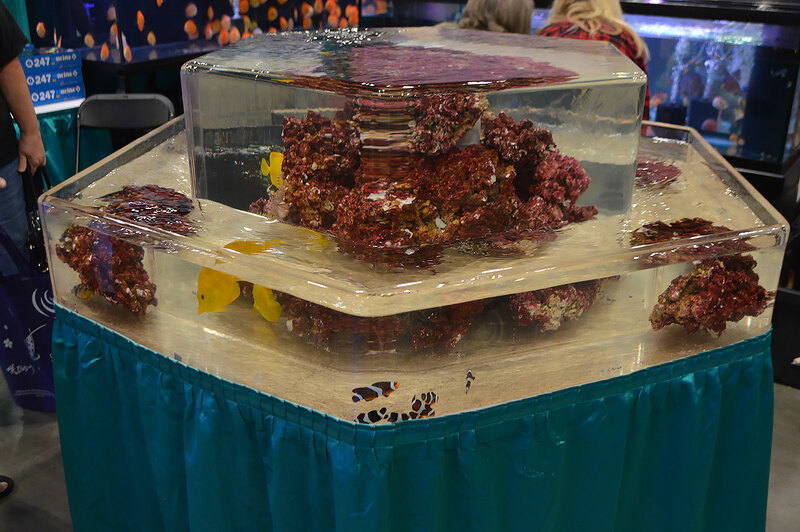 JBJ’s large booth offered a few marine aquariums, including this small reef put together with Exotic Aquatics. 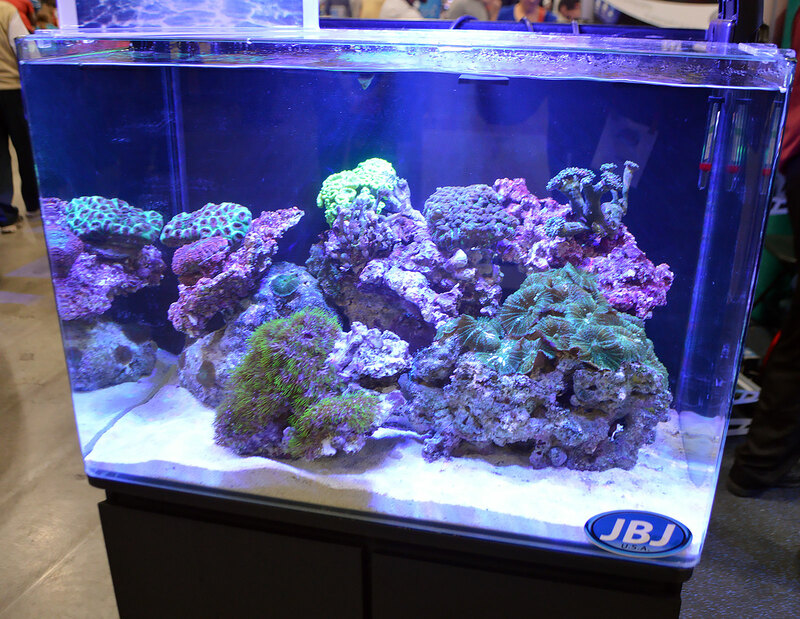 JBJ’s frag tank was set up to sell! 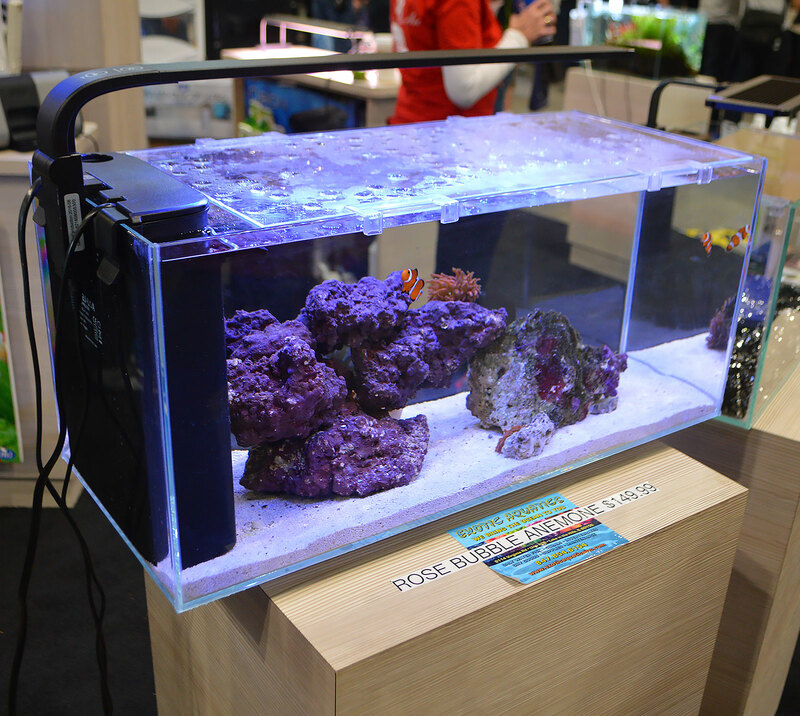 This peninsula-style all-in-one aquarium, JBJ’s Rimless Desktop 10G Flat Panel, was also on display by JBJ. A sleek new offering in the nano-aquarium realm, JBJ displayed multiple new, larger sizes of the CUBEY, coming soon. 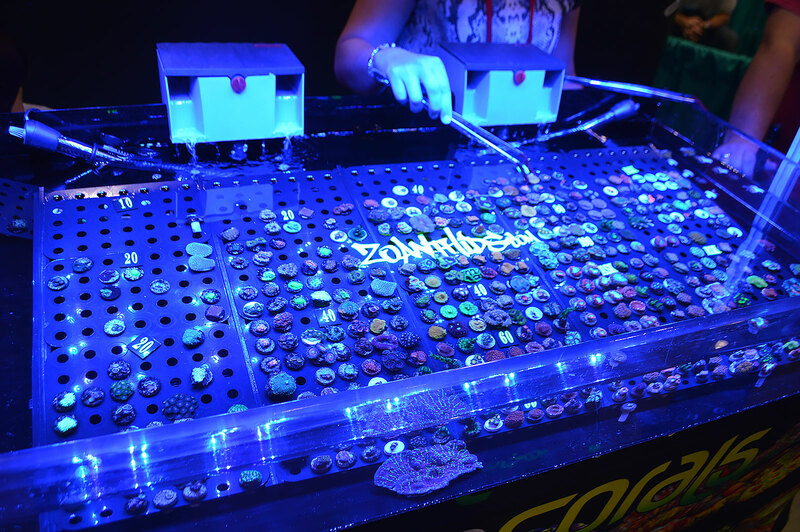 Marine aquarium livestock wholesaler A & M Aquatics offered up a rather unique display of coral frags. Another reef aquarium display, this one at the Pecan Grove Solutions booth. 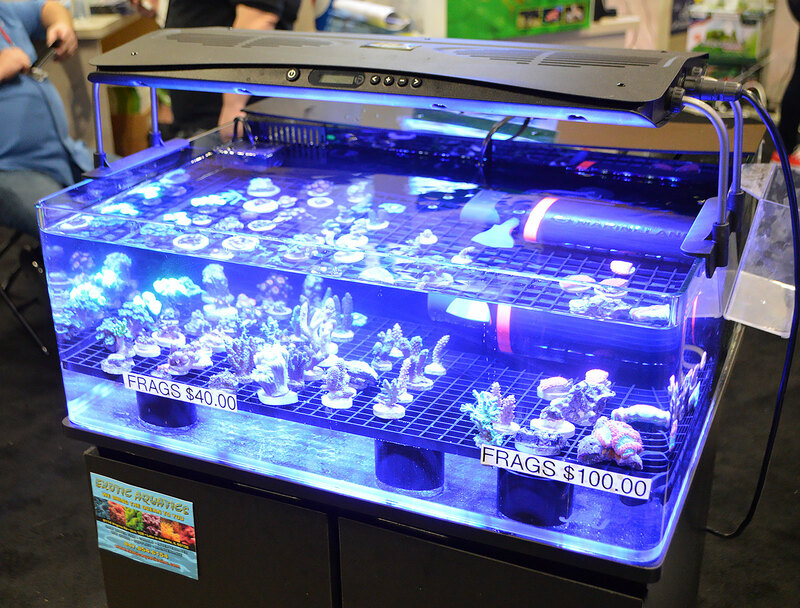 Aqua Visions was loaded with freshwater aquarium fish, but also included this display of saltwater offerings. 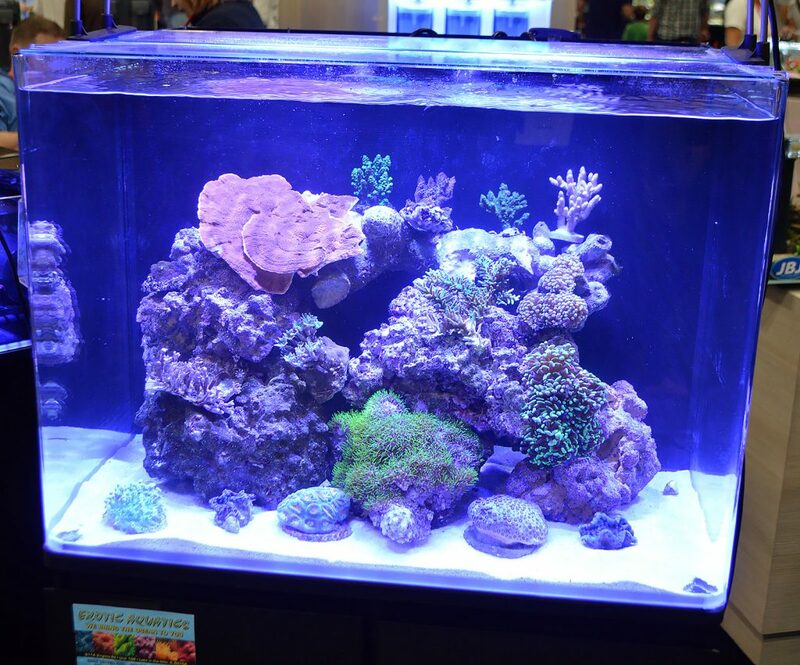 Ming Trading showed off this reef aquarium, set up by Sea Schor. 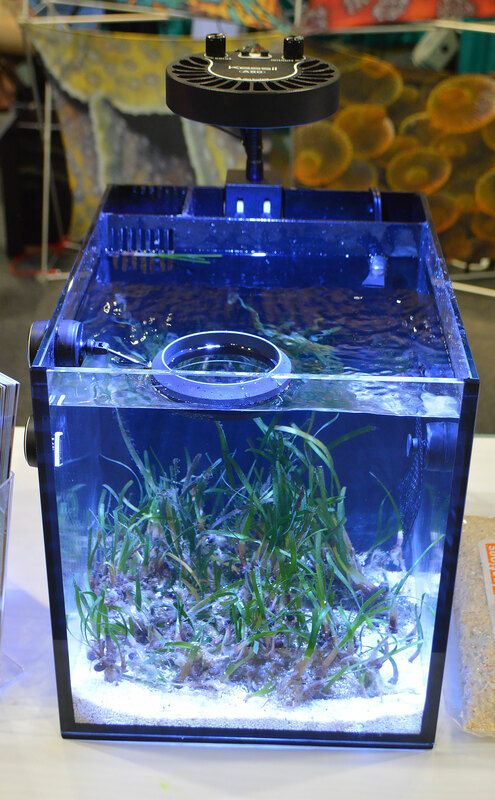 Seagrasses on display at the Two Little Fishies booth. 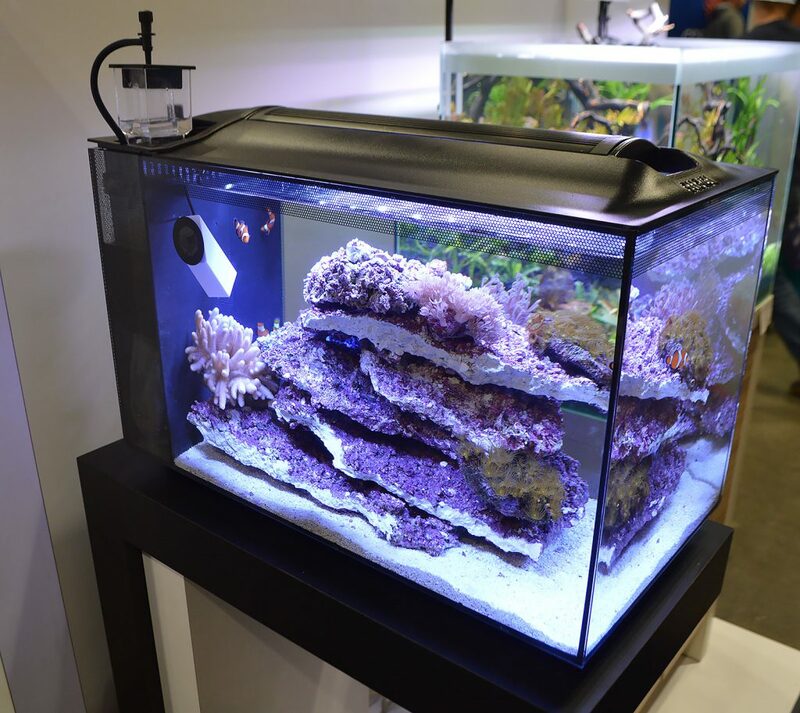 One of three coral frag sale tanks on display by Supreme Reefs. 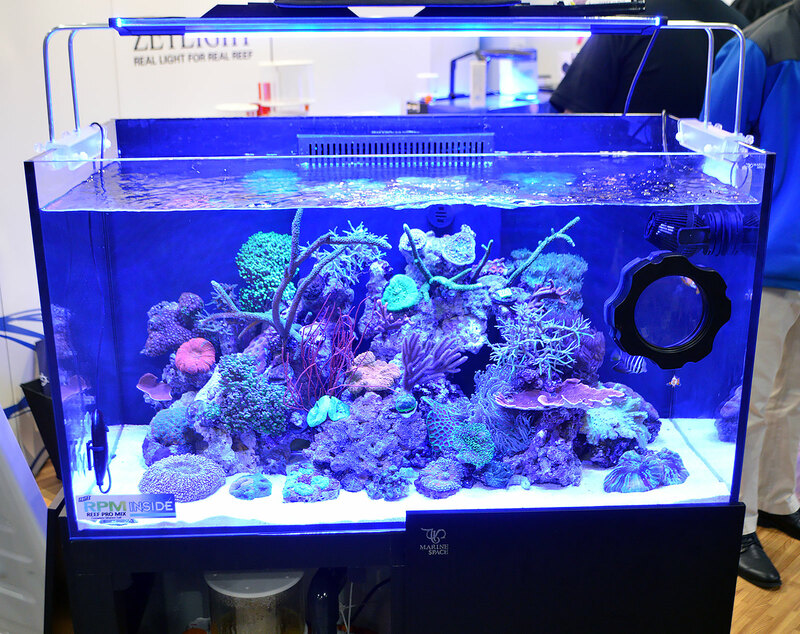 Cincinnati Area Reef Enthusiasts showed off this interesting marine aquarium utilizing a Fluval Edge. 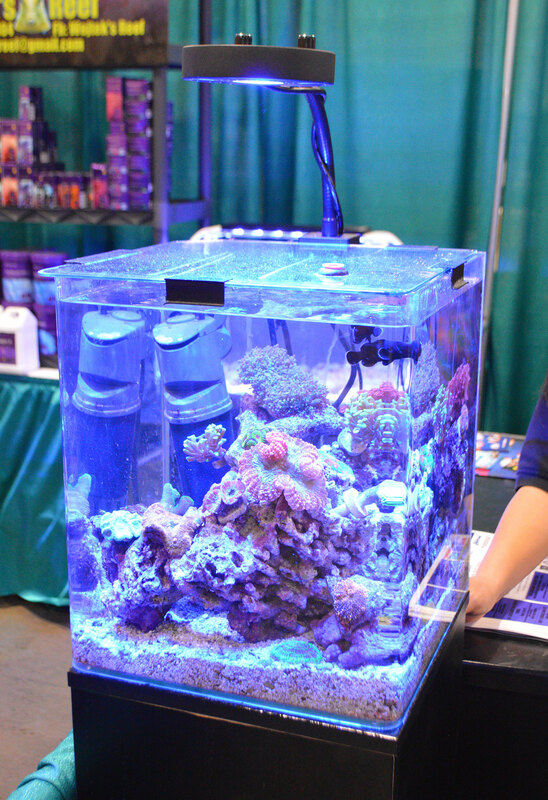 This Dropoff Reef Aquarium set up by TankItEasy continued to spin the entire show. You must watch the video. 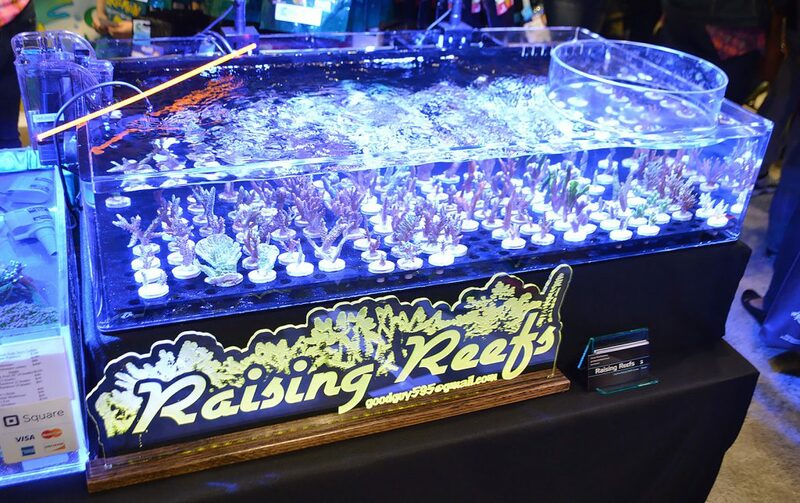 BONUS: Watch the video of the 360 degree spinning reef tank! 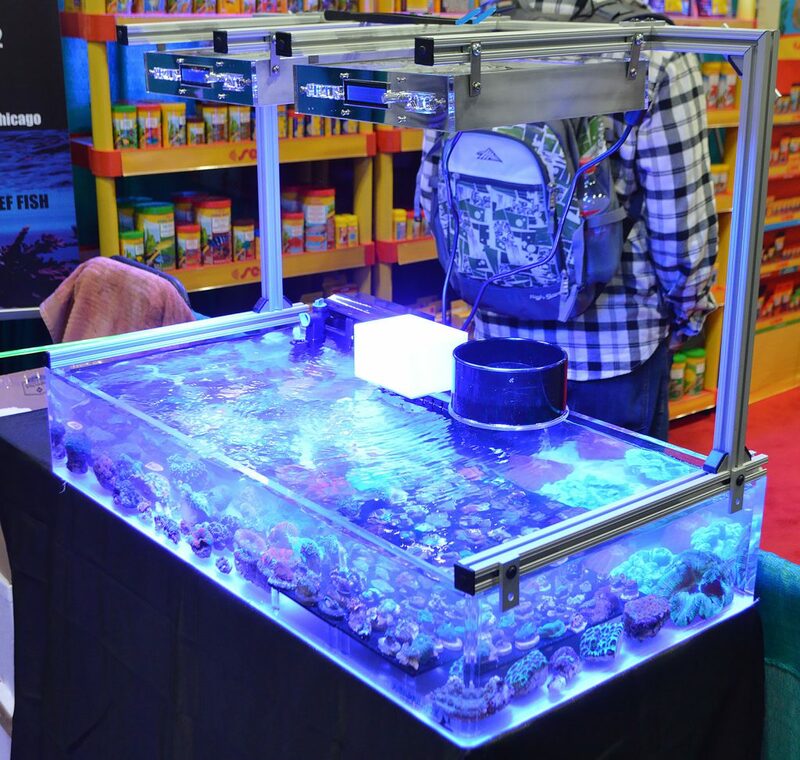 Coming Soon: Check out the amazing Freshwater aquarium displays from the 2016 Aquatic Experience – Chicago. 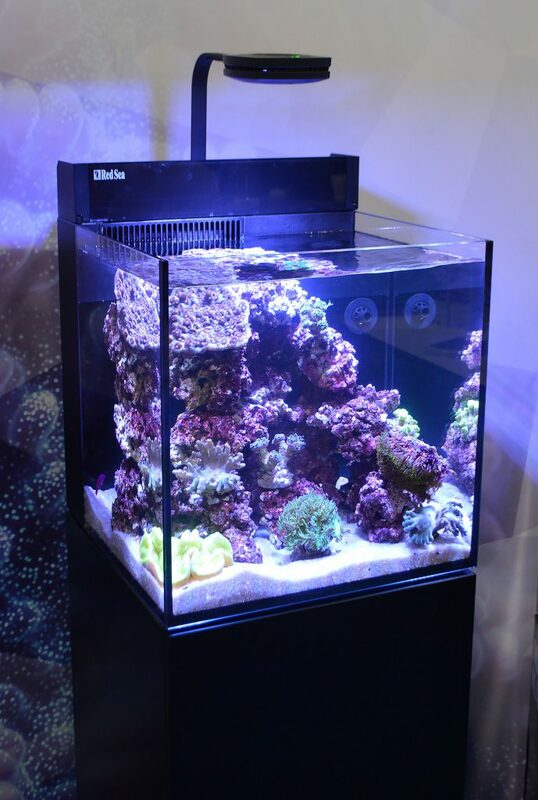 What is the white thing stuck to the tank in the second Evo 13.5 photo? (i.e. photo DSC_0191_1600w.jpg based on the file name.) Is that white thing a power head? Camera? Sensor? Yeah, this photo – http://www.reef2rainforest.com/wp-content/uploads/2016/11/DSC_0191_1600w.jpg – I honestly don’t know! I’ll see if I can find out. Yeah, this photo - http://www.reef2rainforest.com/wp-content/uploads/2016/11/DSC_0191_1600w.jpg - I honestly don't know! I'll see if I can find out.